Discussion in 'UFC Discussion' started by 76Knockout, Jan 17, 2013. I guess its a two part question, do YOU think Forrest deserves to be in the HOF? And do you think he WILL get in the hall of fame? 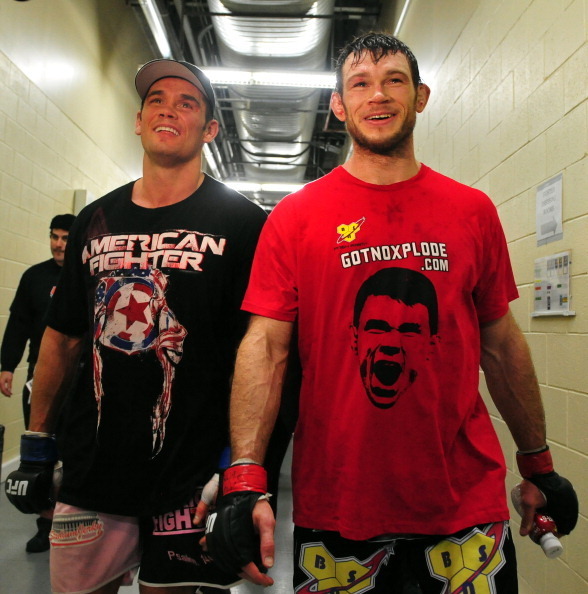 Forrest Griffin had extreme ups and downs throughout his MMA career, but on the whole it was an amazing career imo. Forrest's UFC record stands at 10-5, he is the winner of the first season of The Ultimate Fighter. His fight with Stephan Bonnar helped the explosion of the UFC in the mainstream, and he is a Former UFC Light Heavy weight Champion. In my opinion, Forrest definitely deserves to be in the Hall of Fame, and i think he will get in. Without a doubt, yes to both. Yes he does deserve it. Yes he will get in. He's a management favorite for obvious reasons, and the UFC HOF is a management driven marketing tool, not a legitimate Hall of Fame. Yes, because he got his hands on a UFC belt. He has solidified himself as a hall of famer. I think Bonnar would have got in as well if he didn't end his career on such a sour note. I guess he may still. I agree that he might end up in the hall of fame as well. It would be soley based off his first fight with Forrest Griffin. I can name 15 - 20 other fighters MORE DESERVING than Forrest that BELONG in the HOF starting with: Bas Rutten and Frank Shamrock. EXACTLY ! ONLY reason he would get in. I agree, nothing else he achieved in the UFC would really merit HOF. Except that he was always exciting to watch. You hate Forrest cool. Your so cool and hip. Becuase of how imporant his first fight with Bonnar was The UFC, and he won the championship he deserves to be in the HOF. hof should be for legends.. forrest had a great two fight win streak but apart from that he isn't an elite fighter. Is he the best fighter? No. Was he the best fighter? No. Did he and Bonnar revive a dying promotion with one fight? Yes! The UFC would not be what it is today without that fight.